Elliott Merrick had always wanted to cruise the East Coast. Not finding the boat he wanted, Merrick built his own boat when he was just a beginner. 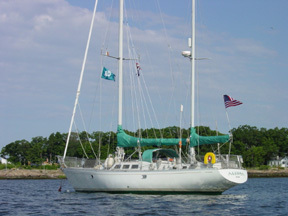 He acquired plans for the perfect boat, a twenty-foot sailboat, and went about building it on weekends, in anticipation of retirement and the cruise of his dreams with his wife and cherished companion, Kay. He describes building his boat, the challenges of navigating in fog with only a compass to steer by, learning how to anchor and set a spinnaker, meeting wonderful characters of every sort along the way. 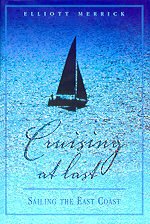 All the trials and all the triumphs join together to tell a spellbinding tale full of passion about the simple joy of cruising. "I sometimes think this coastal cruising requires an inordinate amount of concentration. 'Do you know where all the rocks are,' asked the nervous woman passenger. 'No, lady,' replied the captain, 'but I know where they ain't.'" The story was published posthumously from a series of manuscripts that were intended to be woven into a book at some point in time. The manuscripts were so well written that the publisher simply arranged them in order to reflect what might have been one of the numerous passages Elliott and Kay made in the lovely little Sunrise from Georgia to Maine and back again. "A lot of people wanted something else, or didn't have good enough luck to acquire a cottage, a fireplace, or a boat. That doesn't mean such things are bad. Sort of a moveable place is my boat. She's individual, she's a place that gives the world significance for me. Of course I love her good qualities, her ability to fight to windward when the going is tough. But I have a certain fondness even for her faults."